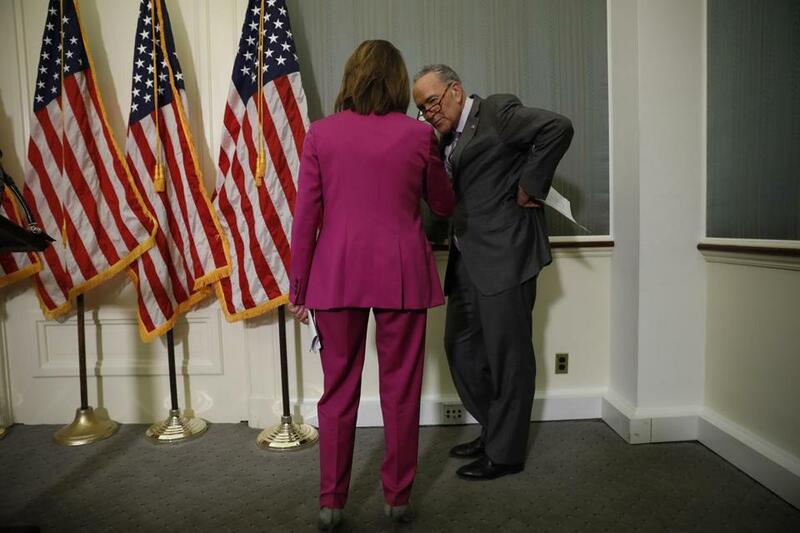 Senate Minority Leader Chuck Schumer spoke to House Minority Leader Nancy Pelosi during a news conference at the Capitol earlier this month. WASHINGTON — On a recent humid day in the “swamp” Donald Trump promised to drain, Democratic members of Congress, led by Nancy Pelosi, marched down the steps of the gleaming Capitol clutching tiny American flags. The sweltering press conference marked the latest version of Democratic messaging ahead of November’s midterm elections amid worrisome signs Republicans are making some gains in the race. Democrats are pivoting from their strictly economic message of “A Better Deal” to include drain-the-swamp rhetoric meant to tap into voters’ anger at Trump and entrenched power structures in Washington. But improving on A Better Deal felt an awful lot like rolling out New Coke. Democrats are turning to branding to mask the underlying affliction in their party: a lack of a unifying force or vision for Americans to rally around. Eighteen months after Hillary Clinton’s lackluster, establishment-oriented campaign foundered in its own overconfidence, the party still seems to be groping for a motivating purpose. Even the setting for Democrats’ latest pronouncements seemed off. The test kitchen is still Washington, and the messengers were the same leaders whom President Trump scorned as entrenched Swamp Things in his outsider campaign of 2016. Democrats have an edge in November and are favored by most political experts to win a narrow House majority, driven by intense anti-Trump feeling among Democrats and anger over Republicans’ efforts to repeal the Affordable Care Act. But there is evidence Democrats’ momentum has stalled as they continue to search for a message that motivates voters who don’t traditionally show up for midterm elections. The difficulty in finding a clear message is compounded by calls from some on the left for impeachment proceedings against Trump. But Democratic leaders fear that building a message around impeachment could backfire by galvanizing Trump’s loyal supporters. 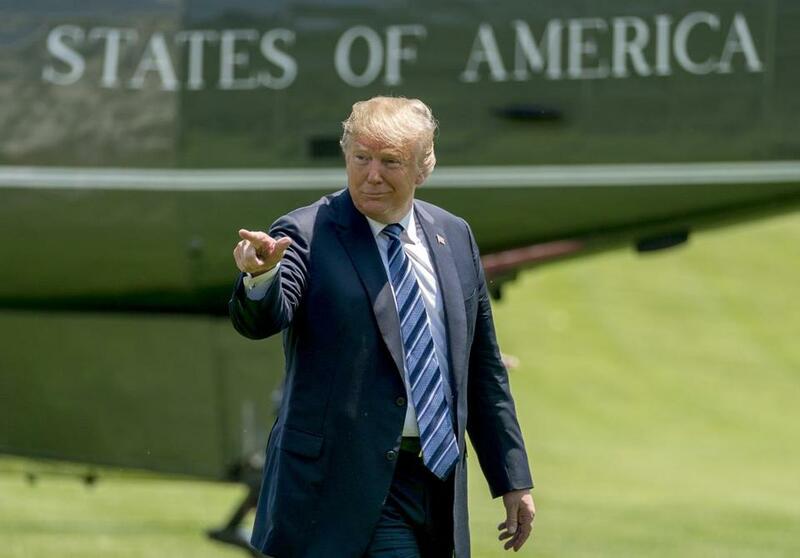 Trump’s approval ticked up to 42 percent last week, with more people crediting him for economic gains. House Democrats’ lead in generic ballot polls shrunk from 12 points at the beginning of the year to just 5 points today. And the Cook Political Report moved four House races in the direction of Republicans, including two key races in California, which are now designated as toss-ups. Democrats need a net gain of 23 seats to win control of the House, and most pundits believe it is a likelihood. Democrats have weaker chances of capturing the Senate. Many Democratic voters are yearning for a more aggressive indictment of what’s going on in Washington that goes beyond Trump. “They want a message that’s a little sharper and recognizes that this country is being destroyed and we can’t stand it,” said Page Gardner, the founder and president of the nonprofit Voter Participation Center. Gardner coauthored a memo with top Democratic pollster Stan Greenberg earlier this month that warned the Democrats’ midterms momentum had “stalled.” They urged Democrats to sharpen their economic message to minority and millennial voters, painting Republicans as recklessly endangering Social Security and health care with tax cuts that primarily benefit the wealthy. President Trump arrived on the South Lawn of the White House in Washington on Friday. Yet it often seems party leaders are uncertain where to turn now that Trump has co-opted populist anger for his own purposes, never mind that he’s a billionaire with outwardly little in common with working-class voters. Last summer, Democrats vowed to champion economic populism ahead of the midterms, bruised by criticism that they had allowed their own anti-Trump animus to eclipse kitchen table issues in 2016. Trump outflanked Democrats with his talk of fair trade, more manufacturing jobs, and vowing to protect Social Security and Medicare — promises a Democratic candidate would normally make. “The number one thing we did wrong is not present a strong, bold economic agenda to working Americans so that their hope for the future might return again,” Senate minority leader Chuck Schumer of New York said while unveiling the new message last July. The “Better Deal” Democrats unveiled then, with its deliberate allusion to Franklin D. Roosevelt’s “New Deal,’’ included proposals for lowering the cost of prescription drugs, making child care more affordable, and raising the minimum wage to $15 for workers. Instead of focusing on Trump’s latest anti-immigrant remark, accusations that his campaign colluded with Russia, or outrageous Twitter attacks, disciplined Democrats would sell a better economic future to voters. But the agenda, by design, was broad and somewhat vague, so that individual candidates could tailor the principles to their districts. A candidate such as Conor Lamb, the conservative Democrat who won a special election this year in rural Pennsylvania, for example, would not want to be tied to an official Democratic agenda promising Medicare for all or a universal “jobs guarantee” — both popular proposals among more progressive members of the caucus but not part of A Better Deal. “Would I have preferred a stronger manifesto? Yes, but I’m not the only one running right now,” said Representative Raul Grijalva, cochair of the House Progressive Caucus. “It’s really hard to break through with a mushy message,” said Alex Conant, a Republican political consultant. So now Democrats are trying the better Better Deal, with its message of anticorruption and campaign finance reforms aimed pointedly at Trump. Once again, there are problems. It’s awkward for longtime members of Congress such as Pelosi (with three decades in the House) and Schumer (with nearly four decades in the House and Senate) to promote a “drain the swamp,” outsider message. Republicans routinely attempt to harness dislike of Pelosi to motivate their base, featuring her in countless ads tying Democratic candidates to her. But out in districts where the midterms will actually play out, Democrats have attracted a considerable number of younger, outsider candidates who can more credibly sell a message of change to voters. This is why Democrats insist they will not blow it and squander their midterm opportunity. Enthusiasm still strongly favors Democrats: A recent Gallup poll found 41 percent of Americans strongly disapprove of Trump, compared to 26 percent who strongly approve of him. And history is on their side. The party opposing a newly elected president captured House control in 1994 (after Bill Clinton’s first election), 2006 (after George W. Bush’s reelection), and 2010 (the year of Tea Party backlash against Barack Obama).